Aquaworld resort really lives up to its name and very well. It is not only a perfect resort to go and stay in but is also has an amazing water park located inside. Aquaworld infact is more famous because of the amazing waterpark than any other reason. You can simply go enjoy a full day in the aqua park or go and enjoy it one day at a time by staying in Aquaworld resort. The resort has a rating of 4 stars and is also famous amongst people for the amazing oriental spa that it has. Groups over 10 people can enjoy discounts if prior reservation is made. Children under 14 must have parental or adult supervision at all times while enjoying the Water Theme Park. Ticket price have VAT includes and are subjected to change without prior notice. Children under 14 are not allowed to visit the Sauna World. Towel, bathrobe, safe deposit and cloak room is available on rent. You can also enjoy overnight stay in the resort. Given ticket price are for adults for 2 hours duration. Given timings are of the Aquaworld. The entire venue is open everyday. Love this? Explore the entire list of places to visit in Budapest before you plan your trip. Fancy a good night's sleep after a tiring day? Check out where to stay in Budapest and book an accommodation of your choice. 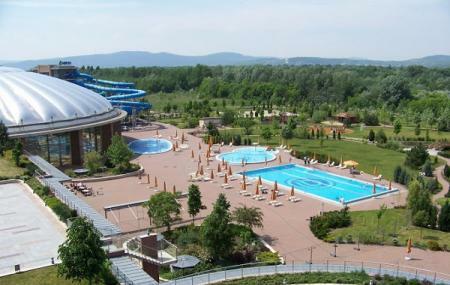 How popular is Aquaworld Resort Budapest? People normally club together Underground Railway Museum and Buda Caves while planning their visit to Aquaworld Resort Budapest. Very good place to relax with the family. I do recommend. Some small things make it 3 and not 5 stars: In the "Oriental" bar the service is so slow that it's faster and cheaper to go to restaurant. 15 min to get a beer? The walk from the apartments is very hard and long, it's a 50 meter from the lobby but for some reason you have to go down, then walk through a long hallway and then up again. They don't tell you this, some people have problem walking. Expensive, twice as a very expensive bur down town. There's no "Russia sauna" as they advertise. The bed was stiff, to stiff. No towels in the pools, WTF? You have to pay for drinks in the evening dinner, for the price we paid, add more for water? But, the stuff is great, efficient, and nice. The spa is excellent, the pools are clean and work long hours. All the amenities of a good big hotel. Clean!!! Very good water park. We had a great time. One of the most beautiful water parks I've been. A lot of activities to enjoy a full day, relax or both. The restaurant has many options and you don't need to carry any money inside, you pay when you leave the Aquaworld. It's open for non guests and the day ticket is fair for the quality offered. Looking forward to go back. This resort is amazing! Rooms are clean, beds are comfortable! Massages are around 40-50€. Pools are clean and nice! Aqua park is crazy. All recommendations! Really nice place to spend some time with family and/or kids, or just simply alone to have some wellness activity. Lots of pools, other entertainments. Worth to try.